Do You Love The Look Of A Doberman And The Personality Of The Labrador? Are You Hoping For A Dog That Is Both Loyal And Loving? Then You Might Be Considering A Doberman Lab Mix Puppy. Let’s Take A Look At What You Can Expect From This Increasingly Popular Cross Breed. Today, the concept of designer dogs is well known and accepted. But where some designer dogs are so popular they are nearly household names (Cockapoo, Labradoodle, Puggle), others are still catching up. The Doberdor is one such hybrid dog. These are two very different breeds when it comes to their temperament, so it’s important that you understand them both before you pick a Doberman Lab mix as your new dog. 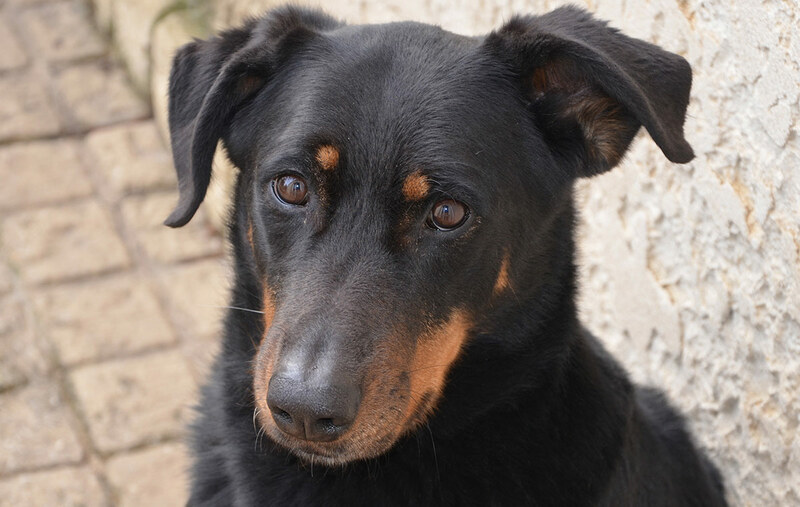 But we can learn a lot about the Doberman Lab mix potential to be a wonderful family companion canine from studying this dog’s universally beloved purebred parents, the Doberman and the Labrador Retriever! Interestingly, like the Dobredor, the Doberman purebred dog breed also has somewhat mysterious origins. What is clear, is that this dog breed first appeared around 1890, courtesy of one Herr Karl Friedrich Louis Doberman. So the story goes, Herr Doberman needed a guard dog to protect him during his work (although his true employment remains equally mysterious: “tax collector” and “night watchman” are two favorite guesses). While Herr Doberman did not live long enough to see it, his German comrades named the new breed “Doberman’s dog” in his honor. Breeding efforts over time shifted from producing a fierce and unpredictable military and police dog to selecting traits for loyalty, protection and trustworthiness. This shift resulted in the Doberman breed taking its place as one of the favorite large dog family breeds, where it is currently listed by the AKC as number 15 in the most popular large dog breeds list. 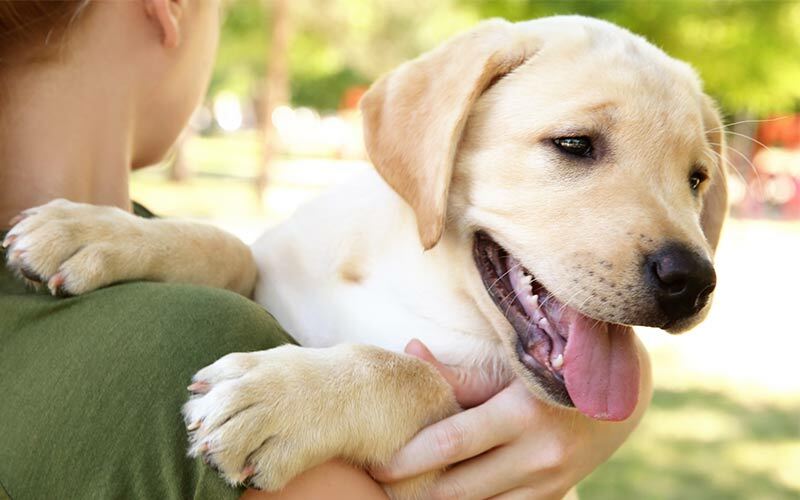 The Labrador Retriever has been the number one most popular purebred large breed pet dog in the nation for a while now. These furry, friendly, loyal and loving large breed dogs are very popular pets and workers. The Lab originally hails from Newfoundland, Canada, which explains this purebred dog’s thick, warm, water-resistant coats and general love of water. Originally bred to do exactly what their name suggests – retrieve – these dogs were bred continually to reinforce these traits and also produce a dog that would be intensely bonded with and loyal to humans. Early Labradors were always black, but today the yellow lab and the chocolate lab have joined the black lab in the purebred lineup. So what happens when you mix these two historically quite different personalities together? The Doberman purebred dog and the Labrador Retriever purebred dog are strikingly alike in some ways. And incredibly different in others. Both purebred dogs are known to be loving, loyal and strongly bonding. They are also affectionate to their owners, athletic and energetic. Not to mention intelligent and trainable. You can therefore expect your Doberman Lab mix to display these qualities when she grows. However, they also have an important significant difference. The Doberman is highly protective and has a guarding nature. Labs are the exact opposite. Being happy to welcome anyone, from friends to burglars, into the home with open arms. When you cross the two, there is no way to know whether your pup will be a social bunny or a bit of an introvert. You don’t know whether your Doberman Lab mix will have this guarding instinct, so thorough socialization is vital either way. From the day your pup arrives home make sure you have lots of visitors, adults and children. Take them to a number of places, with crowds and strangers. I can’t emphasize enough how important this even, even with a mixed breed. Because there is just no way of guessing which trait will be expressed. But if the consistency and discipline of training and socialization is not there, all of the risks inherent in both purebred parent breeds can manifest in a Doberman cross Labrador puppy as well. Lack of ongoing training and socialization will produce aggression, inability to distinguish friend from foe, destructiveness, willful disobedience, separation anxiety and other unwelcome behavioral issues. If you are bringing home a dog with guarding ancestory, it’s really important to take into account. Even if one parent doesn’t. It’s also vital to meet the Doberman parent, to make sure that they are not averse to strangers. A Doberman won’t jump all over you and shower you with love on first meeting, but they should seem totally at ease in your company. Due to their guarding nature, Doberman’s and their mixes must only be trained using positive reinforcement techniques. The reward based nature of these will bring out the best in them. Punishing a potentially aggressive dog is dangerous, as it can mask signs of upset that the dog would otherwise use to show you they are unhappy. You can find out all about the demise of the use of dominance in this article on Alpha Dog Theory. Doberman Lab mixes vary a lot. Your puppy could have the long water-friendly tail of the Lab. Or she could have the shorter triangular shaped tail of the Doberman. The very short tail on adult Dobermans is always a result of docking during puppyhood. When it comes to ears, you can expect longer, floppier ears to predominate in any Doberman Lab mix litter. Since both the Doberman and the Labrador purebred breeds have this ear type naturally. The Doberman’s trademark erect ears are always a result of cropping, a controversial procedure carried out during puppyhood. In terms of size, you can be reasonably certain your puppy will grow up to weigh anywhere from 50 to 80 pounds and stand anywhere from 21 to 27 inches high at the shoulder, with males being larger than females in most cases. One area where there continues to be a great deal of variance in Doberman and Lab mix puppies is in appearance, especially when it comes to the Doberador coat. A purebred Doberman has a short, neat, sleek coat that sheds very little and needs only regular brushing for maintenance. A purebred Labrador Retriever, on the other hand, could safely be called a shedding machine. Their coats are mid-length to long, double layered and thick, with an oily feel due to the water-resistant coating on each hair. Their coats require regular grooming and brushing just to keep them under control, let alone neat. This means a Doberman Labrador puppy could pop out with any combination of the parents’ coat attributes. A Doberdor puppy could have a short but shaggy coat, a long but thin coat, non-oily or somewhat oily hair, a non-shedding or a shedding coat. Coat color can also vary a great deal from one Doberdor puppy to the next. 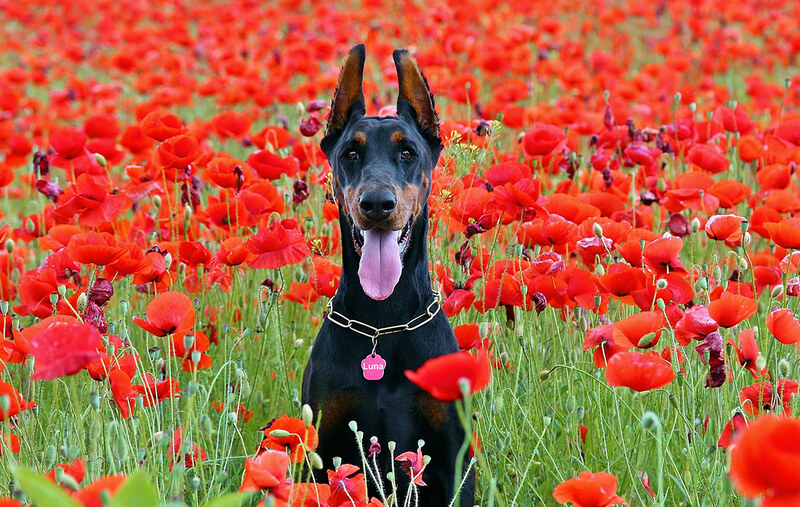 Doberman coat colors range from the traditional show colors of black/tan to blue, fawn, white and even red colors. Labradors have three coat colors: black, chocolate and yellow. So here, you will just have to wait and see what coloration the genetic melting pot produces in your Doberdor puppy! Because of the great difference in coat types between a purebred Doberman and a purebred Labrador Retriever, there is no reliable way to predict in advance what type of grooming maintenance your Doberman Lab cross puppy may require. As mentioned in the previous section here, your Doberdor puppy’s coat could span the gamut from a short, sleek and nearly shed-free pup to a shaggy, serious shedder. You will likely need to wait until your black, yellow or chocolate Lab Doberman mix puppy sheds the puppy coat and the adult coat begins to grow in before you can tell what level of grooming and coat maintenance you are looking at. If your puppy inherits more coat traits from the Doberman side, expect twice monthly brushings and very little shedding pretty much year-round. If, however, your puppy takes after the Labrador side (regardless of coat color), you would be wise to invest in a lint roller, several hand-grooming tools and at least quarterly professional grooming sessions, as well as semi-weekly brushings and the same daily during the big sheds twice per year! There is no dog breed on the planet that is completely healthy. This is simply not possible. However, most purebred dog breeds tend to develop certain “known” (genetic/heritable) health issues, often as a result of breeding for certain traits at the expense of others. Both Dobermans and Labrador Retrievers have their own unique set of known health issues. What this means is that there truly isn’t a way to predict which health issues your Labrador Doberman mix puppy may inherit. For this reason, it is critical to be aware of breed-specific inherited health conditions for each parent, both so you can watch for signs of these health issues manifesting and so you can do genetic testing to ensure you pick the healthiest Doberman Lab mix puppy. Genetic testing can identify some of these issues in the parent. The breeder should have run heart (cardiac), vision, hip and general DNA tests on the Doberman parent before mating. Cervical vertebral instability (CVI or Wobbler Syndrome). Canine hemophilia (Von Willebrand’s disease or vWD). Nervous system-related daytime sleepiness (narcolepsy). Vision loss (progressive retinal atrophy or PRA). Here again, genetic testing of the parents can be your friend when selecting a Doberman and Labrador puppy. Your breeder should have had hip, elbow, eye and general genetic tests for the Lab parent. Canine elbow/hip dysplasia (osteochondritis dissecans). Vision loss (central progressive retinal atrophy or CPRA). Heart valve malformation (tricuspid valve dysplasia). Skin lesions (acute moist dermatitis or hot spots). If you are feeling a bit (or a lot) disheartened after reading through these lengthy lists of breed-specific genetic-based health issues, this is absolutely normal. However you can reduce many of the risks through choosing a puppy from health tested parents. The Doberman parent should have good hip scores, be PRA clear and have a recent clear eye test. There should also be no family history of heart disease. The Labrador parent should have good hip and elbow scores, be PRA clear and have a recent clear eye test too. Sadly, purebred Doberman dogs tend to be short-lived even for a large dog breed. Many Dobermans don’t even live to see 10 years, which is why the Doberman Pinscher Club of America issues a Longevity Certificate to any Doberman who meets breed standards who lives to at least 10 years old. Labradors, on the other hand, can live up to 14 years, although 12.5 years old is more the norm. For this reason, your Doberdor puppy may live anywhere from 10 to 14 years, and only genetic testing during puppyhood plus a thorough review of the parents’ health can help predict which end of the spectrum any given Doberman Pinscher Lab mix puppy will fall. Black, yellow and brown or chocolate Lab Doberman mix puppies are all guaranteed to have one thing in common: extreme cuteness. Before you let yourself get blinded by puppy cuteness, it is critical for your puppy’s sake as well as your own to pause for a moment and carefully consider your selection criteria. Today, veterinarians can conduct a variety of diagnostic and genetic screenings and tests to predict whether a dog’s puppies may later develop heritable health conditions. Some of these health conditions are quite severe and costly to treat. In some cases, heritable health conditions are life-limiting or fatal. To save yourself and any puppy you bring into your life from the pain and expense of dealing with a serious heritable health issue, right now stop and promise yourself you will do your genetic homework before making a commitment to a Doberdor puppy! Be sure to enlist the help of your veterinarian to ensure the puppy you want has the healthiest and brightest possible future life with you! 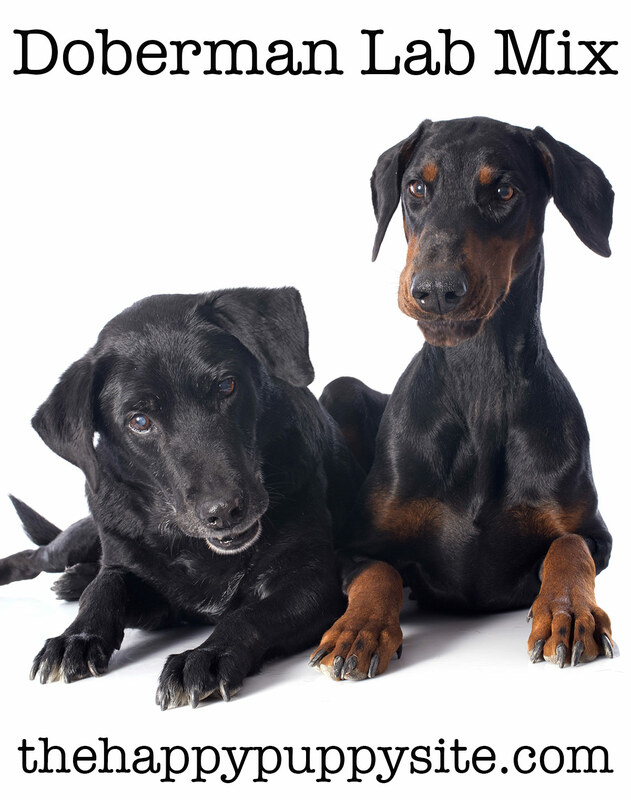 Where applicable, you can use the CHIC breed database to verify information a breeder offers, learn more about a Doberman Lab mix puppy’s parents and learn more about new, emerging breed-specific health issues. Releases all health and genetic testing information on the parent dogs willingly. Allows you to meet and spend time with both parent dogs. Gives you an initial healthy puppy guarantee (typically for six to 12 months). Provides proof of parent pedigrees. Provides verification of all required parent and puppy vaccinations. Will not release any puppy until at least 8 weeks of age to ensure proper socialization. Fully cooperates in answering all your questions, providing you with client references and offering proof of breeder credentials. Offers to take the puppy back if things do not work out. While most breeder-raised Doberman x Labrador puppies are returned to the original breeder if the new home situation does not work out, there are times when a Doberdor may be relinquished to a shelter instead. Here, it is a good idea to contact local shelters and ask to be notified if a Doberman Lab mix dog is relinquished so you can have first right of adoption. However, be aware that just because a dog looks like a Doberman Lab mix doesn’t necessarily mean it is a pure hybrid. The only way to verify this is to do your own genetic testing. Sometimes a rescue organization will also fund genetic testing to verify purebred or hybrid breed status. This is usually done to facilitate placing a rescued pup from desirable parentage in a good home more quickly. Is a Doberman Lab mix right for me? Now that you have taken the time to learn about the popular hybrid dog breed affectionately known as the “Doberdor,” you can continue your search for a puppy with greater knowledge and confidence. Remember, with any dog getting a puppy from health tested parents is key. As is meeting both the parents, especially when one is a guarding breed. Doberman Lab mixes are big dogs. They might therefore have trouble in homes with very small children, due to accidentally bumping them. Especially with those lively Lab genes! They need lots of attention, training and socialization is vital. As well as companionship for much of the day. If you think that you can provide all of this, then a Doberman Lab mix might just be your new best friend. Gruenig, P., et al, “The History and Development of the Doberman Breed,” Blitzkrieger Kennel, 2931. We just adopted an 8-year-old chocolate-lab male dog, what a sweet animal. He loves to ride in the car and minds so well. He is fine with our cat. I have always had Spaniels and Border-Collies and they lived long lives. I hope this one will be with us for a long time too. Hi, my lab-doberman mix puppy is still biting and he is 5 months old now. Also he is little bit aggressive i think. Is it normal ? Please suggest something. I’m looking to adopt a Doberdore. Any suggestions where I might find one? My chocolate lad/Doberman looks just like a lab. She’s 12 weeks old. Not crazy about swimming yet. Also, still struggling with potty training and biting? I had a doberman lab for 14 and half years she live one year past 14 she lived to 15. I hope my girl lives that long? ?